A couple Saturdays ago we went to our friend Erin’s art, yoga and meditation studio‘s grand opening. On the way we decided to stop at Chipotle for lunch. It was then that I realized I had nothing for Sophie—no food, no bowl, no bib, no spoon. I could have nursed her but I’m trying to cut back. She’s supposed to be eating finger foods now so Andy suggested we order her something. I was aghast. Sophie has never had fast food. In fact, most of her food is pretty healthy—Earth’s Best baby food, Gerber’s organic baby food, mashed-up bananas and avocados, Cheerios, breastmilk and the like. But it was 12:30pm. Her lunchtime. She was hungry. 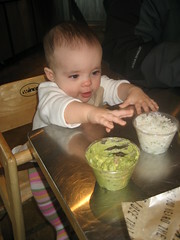 Andy suggested a small cup of rice and a small cup of guacamole. That didn’t seem so bad. So I agreed. Sophie’s not a big eater. At her last appointment I was so proud to tell the pediatrician that she was eating a half jar of baby food three times a day. The pediatrician kindly told me that most babies her age eat two jars of baby food three times a day. So in addition to me trying to nurse less, we’re trying to get her to eat more. Perhaps Chipotle is the key. This entry was written by kara, posted on January 19, 2009 at 11:09 pm, filed under Uncategorized. Bookmark the permalink. Follow any comments here with the RSS feed for this post. Post a comment or leave a trackback: Trackback URL.